Three cheers for 2015 GRAMMY-winning Levitt artists! Last night, over 25 million viewers across the globe tuned in for music’s biggest night, the 57th Annual GRAMMY Awards at the STAPLES Center. Five of the 83 gilded gramophones given out last night went home with artists who’ve performed at Levitt venues. 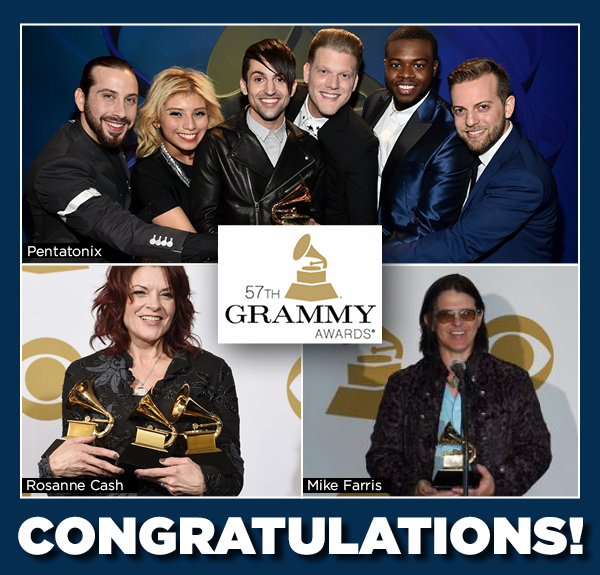 A hearty congrats to GRAMMY-winning artists: Rosanne Cash, Mike Farris and Pentatonix. Congratulations on these tremendous achievements! This entry was posted in Levitt Artists, News and tagged GRAMMY Awards, Mike Farris, Pentatonix, Rosanne Cash on February 9, 2015 by Nicole McGaffey.